Things got pretty crazy at the Statehouse on Wednesday when nearly 500 kids took over the Rotunda, flying drones and displaying robots and Legos. Students from elementary to high school showed off their technology and engineering skills to lawmakers in celebration of STEM Matters! 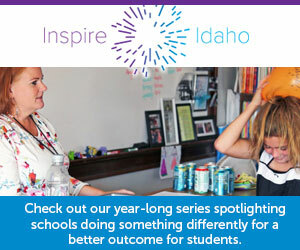 — a campaign to raise awareness about science, technology, engineering and math in Idaho. The Idaho STEM Action Center hosted students from Boise, Emmett and Idaho City to showcase their classroom STEM projects and tools. Students showed off the critical and creative thinking skills they learned in school. The National Guard, Boise Fire Department and Meridian Police Department gave tours of their high-tech vehicles in front of the Statehouse. Gov. Brad Little made an appearance to learn about static electricity through a plasma global. The STEM Matters! event is part of Education Week at the Statehouse as lawmakers begin to piece together the budgets that will drive public schools and higher education campuses in the year ahead. The STEM Action Center is seeking $2 million in ongoing money for the computer science initiative, which helps pay for teacher training, grants for schools, regional STEM fairs and scholarships for students to attend computer science camps. The 2015 Legislature created the STEM Action Center to build a workforce to match the employment opportunities in STEM. The center’s strategy is to strengthen Idaho’s STEM career pipeline with education and professional development for teachers. The STEM Matters! event features how taxpayer money is spent in the classroom. The STEM Action Center is housed under Gov. Brad Little’s office.